Visit profiles to view data profiles on chronic and disabling conditions and on young retirees and older workers. More than 131 million people — 66 percent of all adults in the United States — use prescription drugs. Utilization is particularly high for older people and those with chronic conditions. Prescription drugs are costly. Some $73 billion — almost 16 percent of total health care expenditures — was spent on prescription drugs for adults in 1998. (1) Prescription drugs are a vital component of efforts to maintain or improve health. Advances in new products and technology and increases in utilization — the number of people using prescribed medicines and the number of prescriptions per user — have contributed to increases in overall prescription drug spending. (2) The rising cost of prescription drugs affects everyone, but especially high prescription drug users, uninsured individuals, and health plans. Almost half of the cost of prescription drugs is paid out-of-pocket. Concerns about cost lead some consumers to take less than the prescribed medication. The great majority of adults who have one of five common chronic conditions — diabetes, heart disease, hypertension, arthritis, and cancer — use prescription drugs. For example, 89 percent of people with arthritis and 98 percent of people with diabetes use prescription drugs. People with these conditions fill many prescriptions annually and have significant prescription drug expenditures. Adults with diabetes fill about 4 times as many prescriptions and spend about 4 times as much on prescription drugs as the general population. High prescription drug use may also reflect the fact that people have multiple chronic conditions. 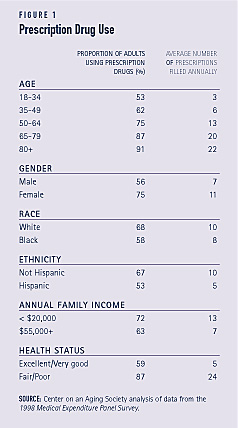 The proportion of people using prescription drugs and the amount of prescriptions filled varies by demographic group. Prescription drug use is associated with age, gender, race and ethnicity, income, and health status. For example, prescription drug use increases with age. Three-quarters of those age 50 to 64 use prescription drugs, compared to 91 percent of those age 80 and older. The average number of prescriptions filled also increases with age, from 13 for those age 50 to 64 to 22 for those age 80 and older (see Figure 1). 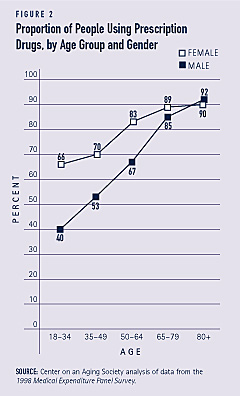 Women are generally more likely than men to use prescription drugs. The gap in prescription drug use between men and women is striking for younger populations. Some 40 percent of men and 66 percent of women age 18 to 34 use prescription drugs. Use patterns converge as people get older, however. 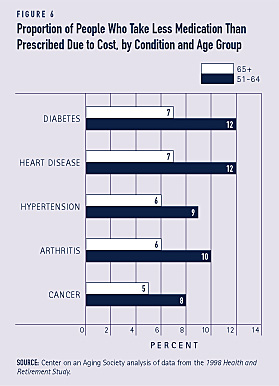 Similar proportions of men and women age 65 and older are prescription drug users. For example, some 92 percent of men and 90 percent of women age 80 and older use prescription drugs (see Figure 2). Prescription drug expenditures are highest for people age 65 and older. Drug expen-ditures are particularly high for the oldest adults. For example, average annual prescription drug expenditures for people age 80 and older are almost 1.5 times higher than those for people age 50 to 64 (see Figure 3). Annual average out-of-pocket prescription drug expenditures for all adults are $177, but people age 65 and older pay much more for their medications. People age 65 to 79 pay $456 out-of-pocket. People age 80 and older pay even more (see Figure 4). Adults pay almost half — 48 percent — of their expenses for prescription drugs out-of-pocket, but persons age 65 to 79 pay 56 percent and those age 80 and older pay 67 percent of their total drug expenditures out-of-pocket. 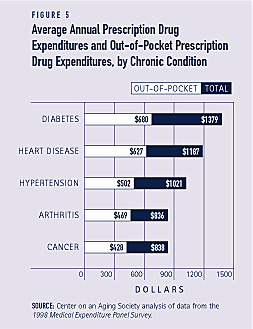 Consumers who have common chronic conditions have substantial prescription drug expenses. 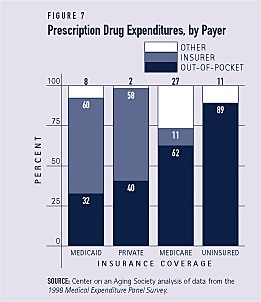 Since their total prescription drug expenditures are very high, their total out-of-pocket expenditures are also high. They pay about half of the cost of prescription drugs out-of-pocket. For example, adults with diabetes pay almost $700 out-of-pocket each year (see Figure 5). Some people take less medication than prescribed because of the cost. This is a particular problem for more vulnerable populations. For example, among adults who report poor health, about one-fourth -25 percent – of people age 51 to 64 and more than one-tenth – 12 percent – of people age 65 and older say that they have taken less medication than prescribed in the past two years because of the cost. Substantial proportions of people with common chronic conditions also report that because of cost they take less than the prescribed amount of medication (see Figure 6). The practice of taking less medication than prescribed may increase overall health care costs if the result is more emergency room visits, hospital admissions, or physician visits. The Medicaid program plays an important role in providing prescription drugs for a particularly vulnerable population. All Medicaid beneficiaries have very low incomes and almost one-third report fair or poor health status. Nationally, Medicaid covers 60 percent of prescription drug expenditures, but beneficiaries still must pay about one-third of the cost out-of-pocket. Because the program is state administered, the extent of Medicaid prescription drug coverage varies considerably among states, however. Medicare beneficiaries pay a much higher proportion of drug expenditures — 62 percent — out-of-pocket (see Figure 7). The average annual out-of-pocket prescription drug expenditure for Medicare beneficiaries is $581, compared to $297 for those on Medicaid and $156 for those with private insurance. For both the uninsured population and Medicare beneficiaries without prescription drug coverage, out-of-pocket drug expenditures may be high if they must pay the full retail price at the pharmacy. The Medicaid program is a significant part of state budgets. Over the past several years, Medicaid spending has grown. Spending on prescription drugs is one factor that has contributed to growth in Medicaid spending. Medicaid spending on prescription drugs grew, on average, by 18 percent between 1997 and 2000.4 In 2000, the program spent $21 billion on prescription drugs. As states struggle to balance budgets, many have adopted policies to control Medicaid spending for prescription drugs. More than half of states report changes in Medicaid prescription drug policies for fiscal year 2003. Many states are negotiating for larger discounts and rebates on their prescription purchases. Another popular strategy is to place some limits on the types of drugs that can be prescribed by requiring prior authorization for prescriptions, using a preferred drug list, or requiring that generic drugs be prescribed. Some policy changes may have a more immediate effect on beneficiaries. These include plans to require new or higher copayments from beneficiaries and rules that limit the number of prescriptions per month that Medicaid beneficiaries may fill. SOURCE: Wachino, V. (2002). State budgets under stress: How are states planning to reduce the growth in Medicaid costs? Preliminary results based on the Kaiser Commission on Medicaid and the Uninsured 50-State Budget Survey. Washington, DC: The Kaiser Commission on Medicaid and the Uninsured. Available at http://www.kff.org. More than 3 million people report using herbal remedies. 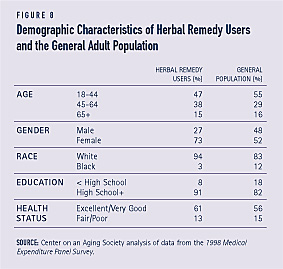 The great majority of herbal remedy users are women. Herbal drug users tend to be white and to be better educated than the general population. They also are in somewhat better health than the general population (see Figure 8). 1. In the 1998 Medical Expenditure Panel Survey, total health care expenditures are defined as inpatient hospital and physician services, ambulatory physician and nonphysician services, prescribed medicines, home health services, dental services, and various other medical equipment and services that were purchased or rented during the year. 2. Bruen, B.K. (2002). States strive to limit Medicaid expenditures for prescribed drugs. Washington, DC: The Kaiser Commission on Medicaid and the Uninsured. Available at http://www.kff.org. 3. Safran, D.G., P. Neuman, C. Schoen, J.E. Montgomery, W Li, I.B. Wilson, M.S. Kitchman, A.E. Bowen, and W.H. Rogers. (2002). “Prescription drug coverage and seniors: How well are states closing the gap?” Health Affairs – Web Exclusive: W253-W268. Available at http://www.healthaffairs.org. 4. Schneider, A. and L. Elam. (2002). Medicaid: Purchasing prescription drugs. Washington, DC: The Kaiser Commission on Medicaid and the Uninsured. Available at http://www.kff.org. Unless otherwise noted, the data presented in this Profile are from two national surveys of the United States civilian non-institutionalized pop-ulation. The 1998 Medical Expenditure Panel Survey (MEPS), cosponsored by the Agency for Healthcare Research and Quality and the National Center for Health Statistics, provides national estimates of health care use, expenditures, sources of payment, and insurance coverage. The 1998 Health and Retirement Study (HRS) provides information about the population age 51 and older. HRS is sponsored by the National Institute on Aging and conducted by the Institute for Social Research at the University of Michigan. The Center on an Aging Society is a Washington-based nonpartisan policy group located at Georgetown University’s Institute for Health Care Research and Policy. The Center studies the impact of demographic changes on public and private institutions and on the economic and health security of families and people of all ages.